Today is Riley Blake Day! HoOrAy! We don’t need to tell you that one of our favorite things to make are skirts, skirts, and more skirts. 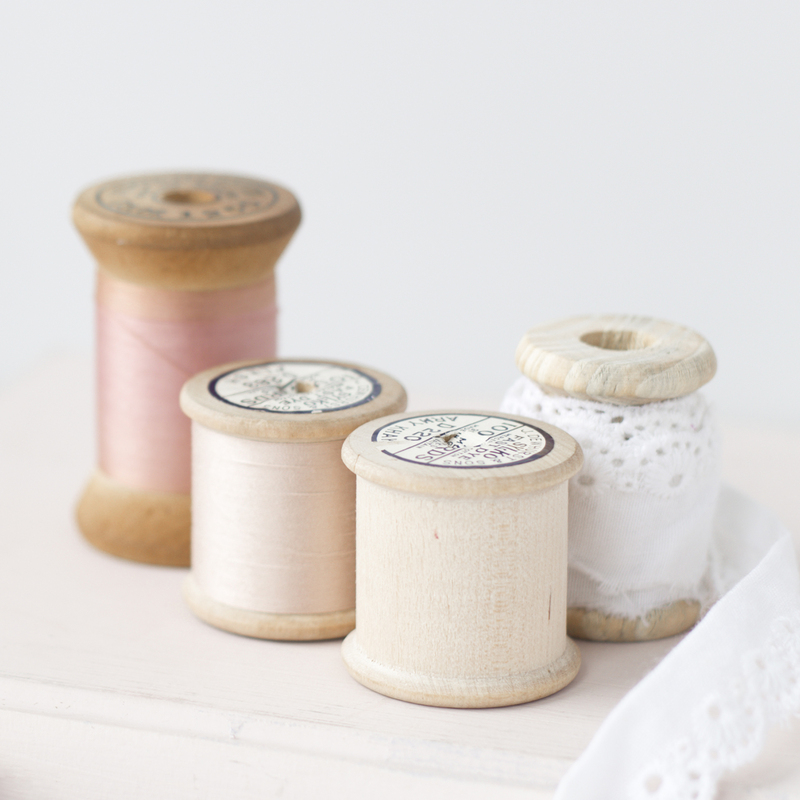 Skirts are the perfect project for any seamstress at any level and today we wanted to share a few simple details that can easily be added to any simple skirt. …but today we each just chose 1 detail and we’ll wait for another day for all the others. And when I say it’s easy I’m not kidding. It literally takes like 15 minutes to complete. 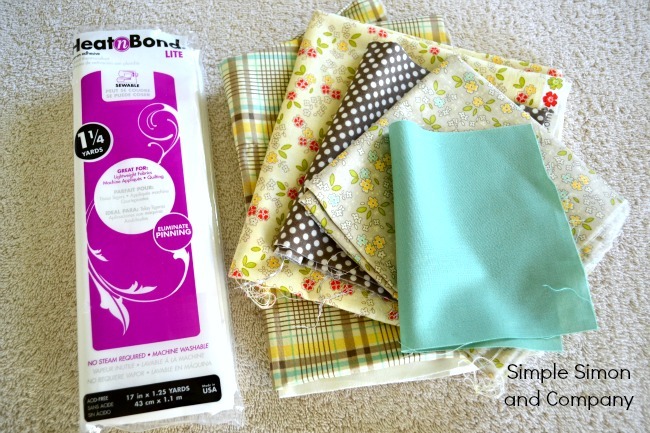 Heat and Bond and your fabric choices. For Gracie’s skirt I used one of Riley Blake’s fantastic colored solids for the main skirt and for the banner I used pieces from their Seaside line (which I am in love with). 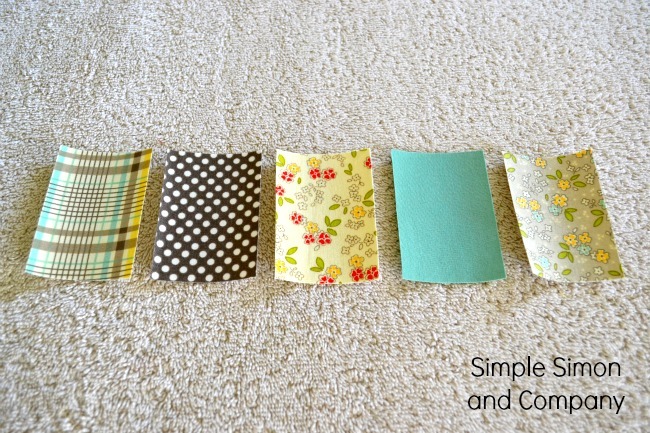 Cut each of the fabrics for your banner pieces into 3 inch by 2 inch rectangles. Fold them in half length wise. 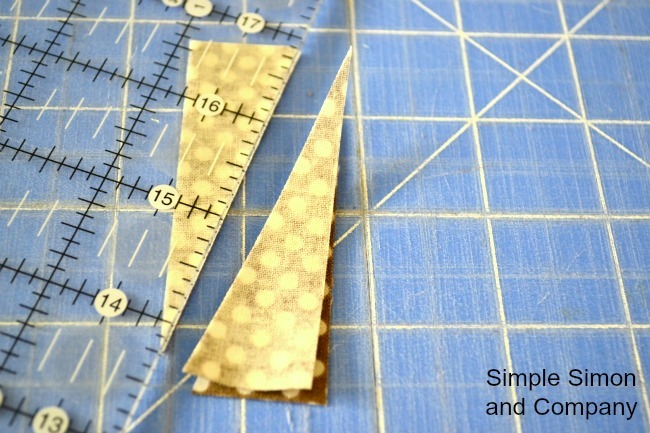 Once folded cut them diagonally from corner to corner to create symmetrical triangles for your banner. Now peel the heat and bond paper off the back of your fabric. 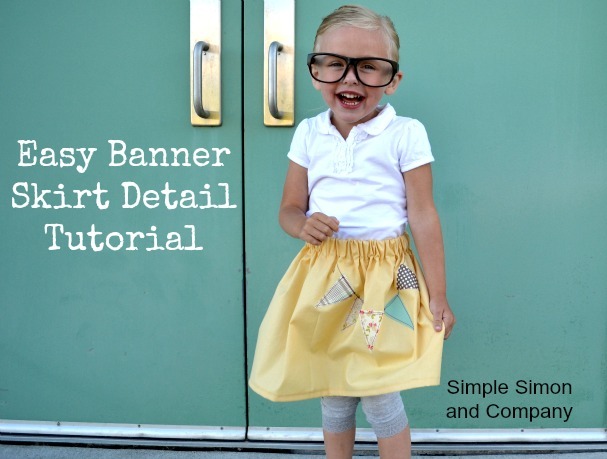 Lay your banner pieces out on the skirt. And if you’d like, draw in the line that you want your banner string to follow. Once you have your pieces arranged how you like iron them down. 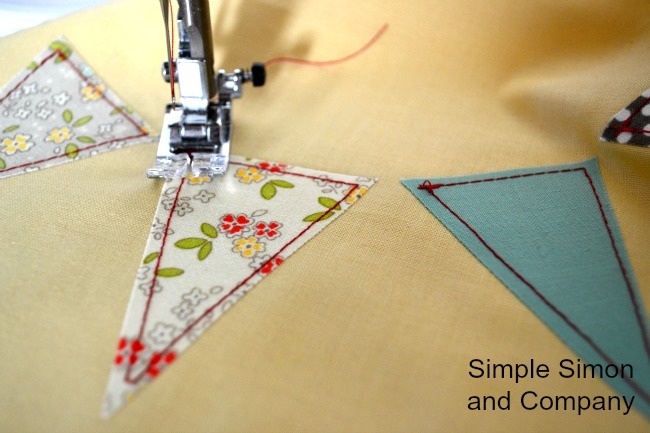 Stitch around the edges of each piece. 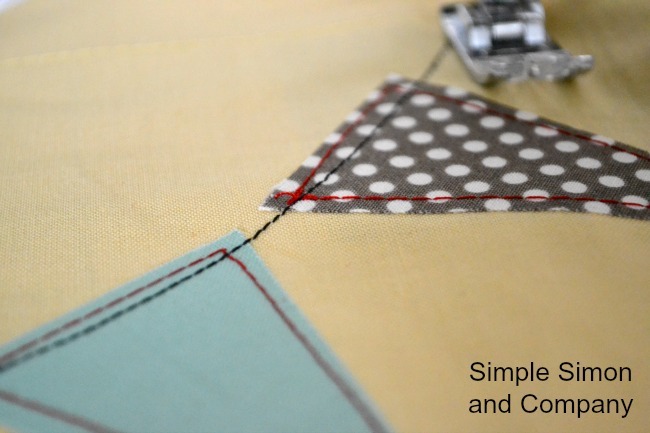 Stitch along your pencil (or disappearing ink) to create the string for the banner. And ready to get down with your bad self. Oh, it’s a good day. Skirts, solid fabrics, and little details…all things I love. Remember to go see Elizabeth’s project over at Riley Blake and then come back over here and enter to win a fat quarter bundle from Riley Blake. To enter just leave us a comment about…oh, whatever the heck you want…your favorite color, something good you just ate, or whatever is currently bugging you..like people who stand way to close to you in the grocery line (happened to me this afternoon…I almost had to open a can right then and there). PS—Yes, now these glasses have been worn by ALL of my kids here on this blog…you should see how often they are worn around our house. We definitely got our $1.50 worth of wear out of them. Thanks for the giveaway! I am actually having lunch as I write and I made a chicken salad with a fresh picked tomato from my yard! Delicious! Cute! Can’t wait to here how your booth did and see some pics! I’m about to embark on another skirt project, too. Grace asked for a “miniskirt” to which my automatic answer was “over my dead and lifeless body” until I realized that she meant a “Minnie skirt” as in Minnie Mouse! (She’s four. I consider it part of my mission to ensure that she looks four.) So I picked up some red with white polka dot fabric, and I’m making her a shirt to go with it, complete with mouse-eared monogram to match the skirt! I’m putting a white tulle ruffle around the bottom of it, and making a coordinating set for baby sister. What a cute skirt….your little miss sure does look sweet in it. I wonder if my grandaughter would wear skirts if I bought leggings to wear under them. Right now, she will only wear skirts with shorts attached. I really need to get cracking and make my little girl some new skirts! She is growing out of hers more and more every day. Thanks for the ideas and the chance to win! I love it! I think I will try the design on a book bag. I LOVE Riley Blake! love that skirt! my favourite colour is bright pink! Love the skirt and the fun picture. Thanks for sharing. I like the leggings under skirt look. I’ll have to try that as it starts getting cooler. Favorite color… pale pink! She is rocking that skirt! Love it. Thanks for the chance to win. I’m about to begin a dress for my mom. Wish me luck! Looove those glasses! Too cute on little kids! What a great prop! How cute is she?! And now you have me singing ‘get down with you bad self’ – ha. Love this skirt! Cute, cute, cute. oh gosh, what is it about people standing too close in lines…that drives me crazy too! and i swear it always happens when im at the dollar store. what is it about that place?! The glasses are hilarious! Love it! My daughter wears glasses like that all the time!! Only hers are hot pink or blue!! Love them!! What a great idea! And so easy, too! Would love to win some fabric. That skirt is so darling. I’m going to have to make some soon. Two awesomely-cute tutorials! You guys are so talented and I love the way you write – so REAL! 🙂 I want to make everything I see that pops up here. I love the skirt and am dying over those glasses!! I love them and she is so darling wearing them!! Just what I need, more fabric to put in my to sew pile! I would love to win. Super cute design. I just came back from my Kindergartener’s celebratory lunch: she was the first person of the new school year to be chosen for student of the week! I am one proud momma! P.S. enter me into the giveaway! Cute skirts – I love Riley Blake’s polka dots too! Love this adorable skirt! I enjoyed the bow pocket tutorial, too! Love that skirt. My favorite color is orange. I am currently waiting for all 3 of my girls to finish getting their boots and rain jackets on so they can go out back and splash in puddles, while I sneak a whole bunch of treats for myself. That’s ok, right? So I went through Wub’s closet and counted 37 dresses. Time to switch gears. Skirts! Skirts with banners and bow pockets and chevrons and…is there a 12 step for sewing? Such a cute skirt! Your daughter is too adorable! This is adorable. And I love the glasses. And I can’t stand people who drive slow in the fast lane. Haven’t they read those signs that say sower traffic keep right??? I also have the issue with people standing too close in line. I usully move slower the closer they get! Hiya! I had the bestest clam strips for supper tonight with my major guy. He didn’t want Mexican, which I can eat everyday, so we went for seafood. Delish!!! Thanks for having the giveaway. Blessed be, hugs!!! such cute skirt. i am going to have to make one for my girl. oh, i can not stand for someone to stand up against and especially if they talk loud or need a bath. yuck!!!! thanks for this giveaway. i can sure use some fat quarters. I love your blog and all your cute projects! Thanks for the giveaway! Love the skirt. Have been making skirts for my granddaughter all summer. Favorite color is green, trying to keep a sourdough starter alive, and this horrible heat is making me cranky. I love your blog and all your cute projects! Thanks for the great giveaway! Love the bow pocket and am definitely going to try that out. The bunting skirt is cute ,too, and I love Riley Blake fabric!!! Thanks for all the inspiration! I too am bothered by people who stand too close in line… it’s like they’ve never heard of personal space… i love your blog! wonder if my 7yo daughter would wear a bunting skirt? I hope so! My diva, oops I mean niece, LOVES skirts. I think she will LOVE both designs, can’t wait to try them out. Thanks for the pattersn and the giveaway! I just ate some of my homemade PB cups. OH MY Gah. Fabulous. Peanut butter and chocolate. YUM. Love love love the simple details on this skirt. You are always so creative! I love the glasses!! At my house they wouldn’t still be in one piece….hah! The banner idea is sooo cute! I’m thinking of making some bunting for my cousin’s new baby’s nursery, maybe i should make an itsy-bitsy baby banner skirt to match? Sure would be cute for photos! 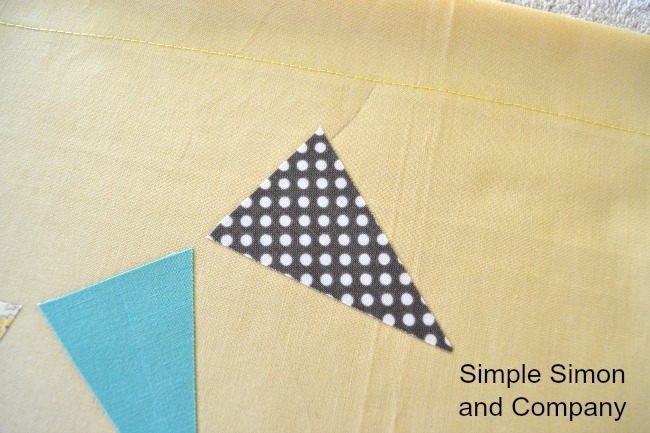 Thanks for the tutorial- bunting is so cute, and I love Riley Blake! Thanks for the cute twist on the bunting craze! Love this skirt and I plan on putting it on the to-do list for fall/school clothes for my girls. Thanks for such a great giveaway. Love your blog! So inspiring! Wish my 15 yr old daughter was more into some of your skirts. Guess that is what the 3 younger nieces are for! I love my wallet. And am so sad that it is slowly dying. I want one just like it, but haven’t been able to find one. Think my day will now include a trip to JoAnn’s so I can find some of that heat and bond. Love this little banner skirt and so will my girls. Going on my list of things to complete this month! Thanks! what a CUTE project, I think I will have to make Nicole a quick simple skirt with big pockets and a sweet bunting. Perfect for school! Grace is the best model. Love all her little poses and faces. Showed this to my little Bekah and she LOVED it! So glad, I already got the Wonder Under to make one (our store was out of Heat and Bond as you suggested). Now, I’ve also got to make a cute little Bow Pocket Skirt too! Teach me to hop through the blogs…LOL! SUCH fun ideas for skirts-love both of the ideas, the banner and the pocket with bows.. love me some fabric as well. Thanks! Cute skirt on a cutie pie of a little girl. Just found your blog tonight and have been enjoying looking around. Love the skirt! 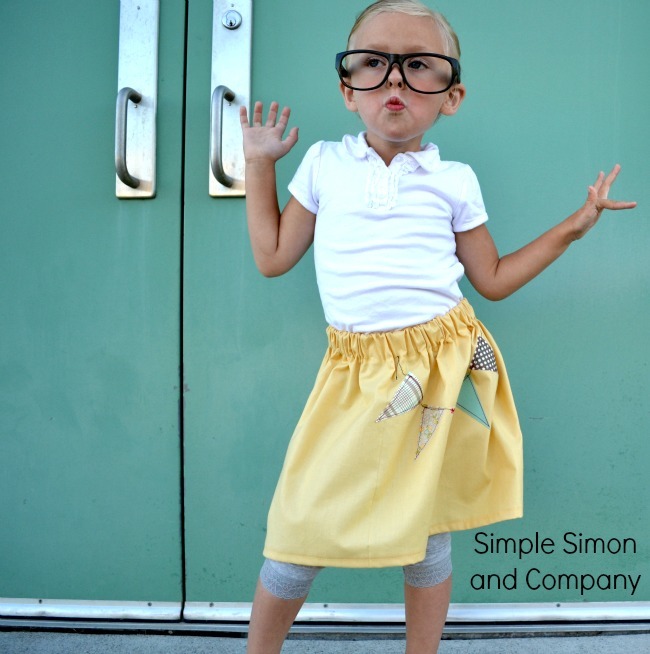 There is something about little girls with skirts and leggings that is just adorably cute! I guess I should make a few for my 2 year old granddaughter, I just made two ruffled skirts for her birthday with matching blouses, one has appliqued owls, then I combined another ruffled skirt with a peasant top and added rick rack and applied owls to it,I have some yellow leftover for a skirt like yours! I LOVE THIS! Totally doing some of this to my own clothing. Hehehe. You have made me giggle…thank you for that…I am going to get down with my bad self and see if I have any heat and bond…..